Featured #bloomgirl: Kristen; Founder of Dō, Cookie Dough Confections! This month's featured #bloomgirl is Kristen Tomlan, founder and CEO of Dō, Cookie Dough Confections. Dō is a cookie-dough store located in the West Village of New York City, that sells raw, edible cookie dough in a variety of flavors! Dō has become a tourist destination since its opening in 2017 with lines going down the block and having a wait time of over an hour! I had the privilege of working with Kristen for many years and watching her go from an online business to one of the most talked about dessert places in New York City is truly incredible! She epitomizes the term "Girl Boss." Scroll down to read more about one of Forbes' 30 Under 30, Kristen Tomlan! I'm Kristen Tomlan, founder, and CEO of DŌ, Cookie Dough Confections in New York City! At DŌ, we specialize in all things cookie dough--baked and unbaked! As a cookie dough lover myself, running this business is my absolute dream come true! Since opening my shop's flagship scoop shop (the first in the world!) at the beginning of 2017, DŌ has taken off, spurring the worldwide craze around edible cookie dough. Fans from all over the world come to New York City every day, just to try our cookie dough! DŌ's been featured on Buzzfeed and Insider as well as in publications like O Magazine and People Magazine and on television programs like the Today Show. DŌ's celebrity fans include Kim Kardashian West, Gigi and Bella Hadid, and Ryan Seacrest. I, myself, am a home baker with Midwest roots from outside of St. Louis, Missouri, so to say that I have to constantly pinch myself to believe that all of this is actually my life is an understatement. I spend pretty much all my time at DŌ, running the business, but when I take some time off I enjoy being at home with my husband in our cozy Brooklyn Heights apartment or running around Manhattan with our friends, trying all the latest and greatest that the NYC food and beverage scene has to offer! One of my big inspirations has been my Mom! She taught me how to cook, is a great role model and a great source of support for me! Launching my business was definitely the biggest challenge of my life. I was happily employed at an amazing consultancy in New York City, designing retail experiences for brands like Kiehl's, Samsung, and Mercedes. I loved what I did and the people I worked with, so considering leaving it behind to pursue my cookie dough passions was an extremely difficult, as well as nerve-wracking--what would I do if it didn't work out? Not to mention, at the time when I was preparing to launch DŌ, I very suddenly came down with a serious, life-threatening illness, which led to my hospitalization. Pulling through recovery was the hardest thing I have ever done in my life, but my illness made me realize that life is short and you have to chase after the things you want. I used that drive not only to heal myself physically but also to propel my business into existence. I would tell myself to get ready to roll with the punches. The truth is, there's no way of knowing exactly what is coming down the road ahead, so there's not possible way that you can ever truly be prepared for everything. All you can do is your best to plan ahead and work hard to face anything unexpected that arises. 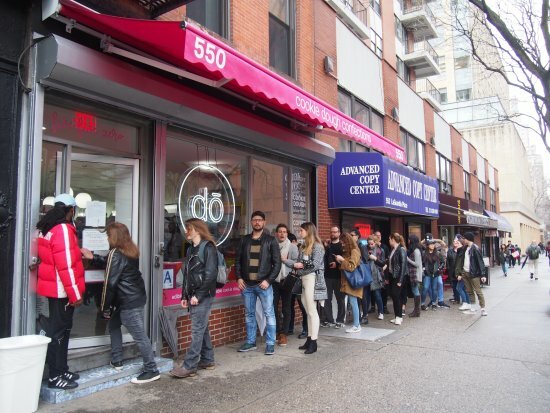 When I opened DŌ, I was not prepared for the demand that we met--not even close! The night before opening, my husband and I were nervously joking about what would happen if no customers showed up in the morning...well, they showed up alright. We had a line down the block straight away. We sold out of everything, made more, and then sold out of that--wash, rinse, and repeat until we were out of every ingredient. I didn't have enough staff. I didn't have enough anything. It was stressful at the time, but I learned so much from that experience. Life, running a business... it's all a learning curve. All you can do is your best and get back on your to try again feet if things don't go the way you expect. My background in branding and design was probably the one thing that had the biggest influence on shaping DŌ as it is today. Everything in DŌ's physical storefront was designed with the customer and social media in mind, from the lighting to the wallpaper and the neon signs. In addition, DŌ's social media efforts and design elements are all tailored to specifically to the DŌ aesthetic and culture. Everything we do at DŌ is intentional and done with a purpose; I'm not sure that DŌ would be as successful as it is today had my background not been in branding and design from the get-go. My favorite bloom products are definitely the planners! When you're running a business like DŌ, there're a million things to keep track of--from interviews to meetings, to social opportunities--without a planner, I don't know how I would ever remember all of it! I love Bloom's planners because they're easy to toss into a bag and take with me on the go, but adorable enough to sit out on my desk! The bright colors, fun sayings, and feminine designs really match DŌ's aesthetic! I hope you enjoyed learning more about Kristen and the face behind DŌ! Do you have a #girlboss story to share? Email us at bloom@bloomplanners.com for a chance to be our next featured bloom girl!